Let’s get to the point: if you’re not taking any whey protein post-workout, you’re wasting your time. Whey proteins are most effective at this time, when your muscles need nutrients quickly. But we’re preaching to the choir, here: you know you need it, it’s just a matter of finding a quality supplement to suit your needs. 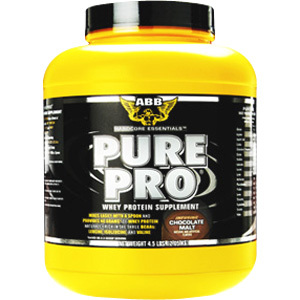 Look no further than Pure Pro for a straightforward, high-quality whey protein to support your physique’s hungry muscles. other ingredients:Protein Blend (Whey Protein Concentrate, Whey Protein Isolate), Cocoa, Natural and Artificial Flavors, Salt, Acesulfame Potassium, Cellulose Gum, Sucralose, Xanthan Gum. Pure Pro Whey Protein Powder Chocolate Malt is shipped in a discrete, unmarked package. Orders are processed immediately and usually take about 3 to 5 working days to be received. We do ask that you try it for 2 to 3 weeks to feel the full effects. Any information received is used only for order processing and shipping purposes. Your information, such as e-mail address, will never be disclosed to a third party.